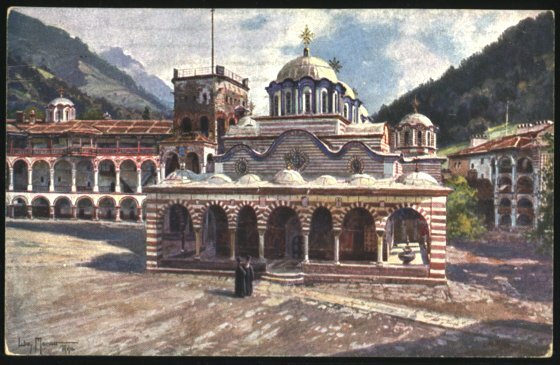 The Balkan postcards were issued for the Red Cross during World War 1. The cards have 6 different motives from cities in Bulgaria and the Bulgarian occpation areas, and pictures of famous officers or politicians on the back. 3 of the cards are cancelled in Sofia, 1 in Philippople, 1 in Skopie and 1 in Gjumjurdjina. On all cards the postage is paid with the 3 St special surcharge (Mi #107) and an additional 2 St with either 2x #79 or #101. The 3 St surcharge stamp was reprinted with 110,000 issues. 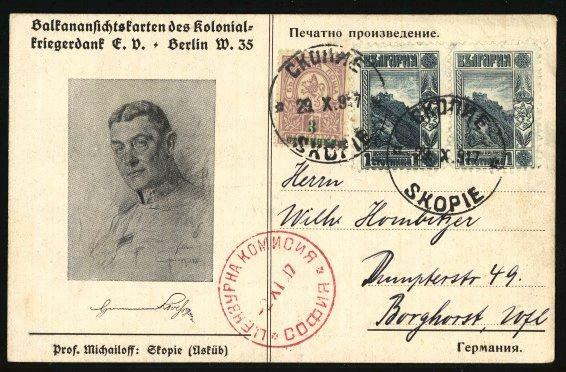 Of these, 100,000 were given to the head of the German sanitary commission (the Red Cross). 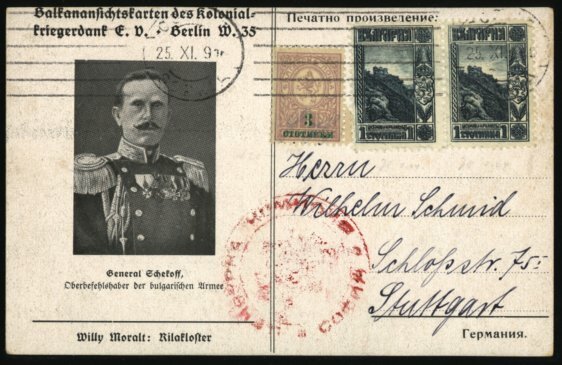 For a price of 5 Reichsmark the customer received 12 postcards (2 of each motive). 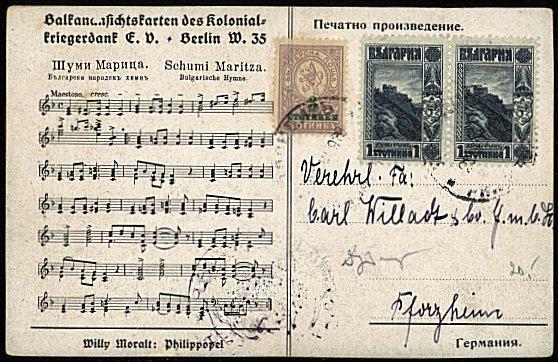 In the lower right corner of the cards the Bulgarian word "Germanija" is printed, indicating that the Balkan cards were issued exclusively for the German market. Note that the 3 St surcharge also exist as forgery. 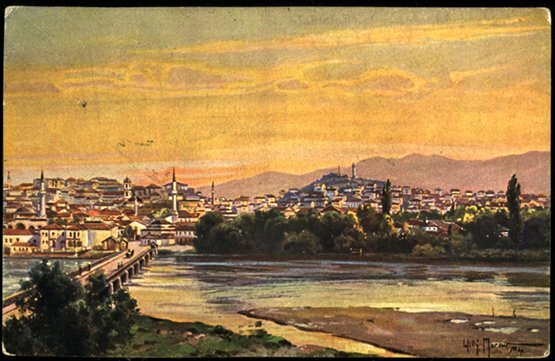 -> Go to this gallery to see Balkan cards from Turkey! General Max von Gallwitz was born in 1852. He was general of the German artillery during WW I. At the beginning of the war, he commanded an independent cavalry corps on Germany's right flank on the Western Front. Later, he commanded the XII. Army (1915). He was awarded the Pour le Merite, Germany's highest honour, in 1915 for his good efforts against the invading Russian forces in Galicia. Max Gallwitz then took control of the XI. Army (1915-16) from General Mackensen, who had finished a hard but successful offensive to drive the Russians from Galicia. He then led Army Group Gallwitz at the Somme during the summer of 1916. Gallwitz also commanded the II. Army (1916), and the V. Army (1916 to 1918) when it countered the American advance into the St. Mihiel salient. Finally, he was given charge of Army Group Gallwitz at Verdun in late 1918. By the end of October 1918, Gallwitz was set against any sort of armistice, believing it was both shameful and the end of Germany. He was preparing a national defense network in the event of collapse on the Western Front, but the revolution and the armistice preempted his plans. From 1920 through 1924, retired General Gallwitz was a deputy for the German National People's Party in the Reichstag in Berlin. 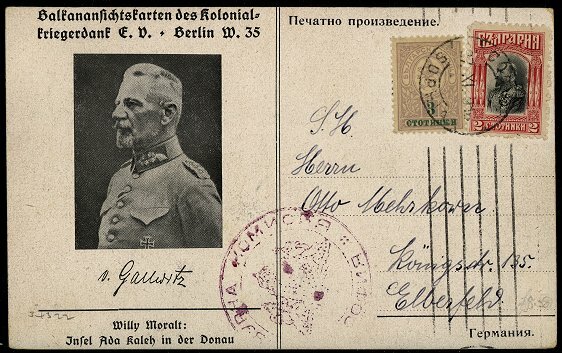 Max von Gallwitz died in Breslau in 1937. Picture side: Dr. Vasil Radoslavov (1854-1929), Minister-President of Bulgaria from 1913 to May 1918. Vasil Radoslavov (1854-1923), Bulgarian politician. He held the position as Minister of Justice in the Government of Karavelov 1884-1886, then as Prime Minister and Minister of Internal Affairs in the Government of Stambulov 1886-1887 but left Stambulov's government after Ferdinand's ascent to the throne. In the summer of 1913 he formed his own government, and made a considerable contribution to bring Bulgaria into World War II on the side of the Central Powers. After Bulgaria's defeat in 1918 Radoslavov retired from power. 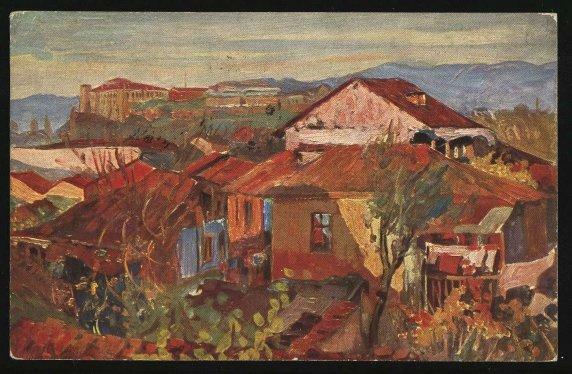 Nikola Todorov Jekov (1865-1949) was born on 6 January 1865 in Sliven. 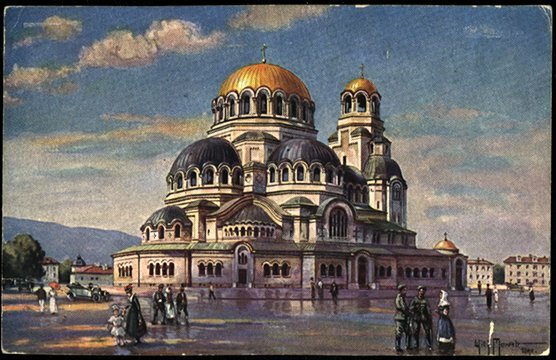 In 1883 he enrolled in the Military School in Sofia. In 1896 as a cadet he took part in the dethroning of Prince Alexander Battenberg I for which he was relegated to the rank of private. Later pardoned he graduated from The Military School. During the First Balkan War (1912–1913) Jekov was Chief of Staff of the Second Bulgarian Army that operated against Edirne. 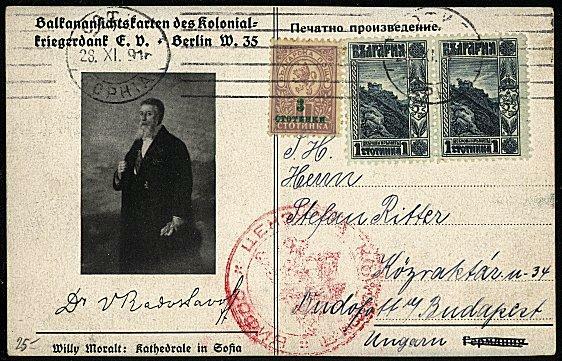 During the Second Balkan War (1913) Jekov fell ill and could take active part. After the war he was appointed as Chief of Staff of the occupational armies in Western Thrace. On 2 August 1915 he was promoted to the rank of major-general. Between 19 August and 4 October 1915 gen. Jekov was Minister of War and after that was personally appointed by King Ferdinand I as Supreme Commander of the Bulgarian army (1915-1918). In 1918 gen. Jekov fell ill again and travelled to Vienna for treatment. While abroad he was dismissed from the army and transferred into the reserves. 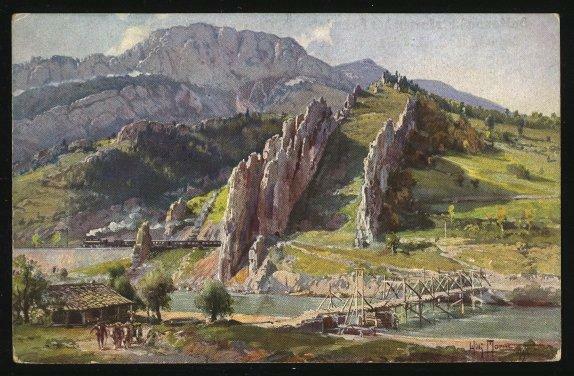 He spent several years in exile in Germany and Austria. When he returned to Bulgaria on 21 October 1921 he was sentenced to 10 years in prison for his role in the second national catastrophe. He was pardoned after three years, however, and released from prison in 1924. After his release from prison he became a lecturer in the Bulgarian Military Academy and wrote books on military subjects. During the Second World War he was personally invited by Hitler to visit the Western Front. Jekov expressed strong anti-Semitic and anti-communist views. In September 1944 he emigrated to Germany and in his absence was sentenced to death by the Bulgarian People’s Tribunal. Nikola Jekov died on 1 November 1949 in the Bavarian town of Füssen. Picture side: The Bulgarian National Antheme "Schumi Maritza"
Hermann Freiherr Kövess von Kövessháza was born in Hungary in 1854. At the outset of WWI, Kövess was ranked General der Infanterie and was in control of the XII. Corps in the II. Army, led by General Böhm-Ermolli. His Corps was the II. Army's only representative on the Eastern front, as the rest of the army was in transit from the Vojvodina front, and was assigned to defend against the entire Russian III. Army under General Russky. Kövess then accepted the command of the III. Army, at that time situated in the Vojvodina, for the purpose of invading Serbia. What followed was the tremendous defeat of the Serbians in the Autumn of 1915. Following the surrender of the Montenegrin army after being harried by three Austrian Corps, Kövess was the military governor for the tiny state from 17 January 1916 until 26 February, when he turned the reigns of government over to FML Viktor Weber. (Kövess would be named to this governorship again in late October 1918, but that amounted to little at such a late date.) Kövess transferred the III. Army into the Tirol in March 1916 to prepare for the Tirol offensive. In May 1916 Kövess was given the rank of Generaloberst, most likely for the successful occupation of Serbia. He transferred from the III. Army on 20 October 1916, taking command of the VII. Army on the same day. He held this command until 16 January, 1918. After this, he asssumed command of Army Front Kövess, which encompassed the whole Moldavian Front from the Dobrudja to Galicia. This was eliminated on 5 April 1918. He then commanded Army Group Kövess, formed on 1 October 1918, which controlled the whole Balkan Front. This Front was stretching as the Entente invaded Serbia following Bulgaria's surrender on 28 September 1918. Kövess' final ascension was at the last hour: Emperor Karl appointed him Supreme Commander in his own stead 1 November 1918. Karl asked for an armistice the same day, and recognised Hungary's independence as well. This left Kövess in a strange situation, since he was a Hungarian. Nevertheless, he accepted the honour knowing full well that time had run out for both the monarchy and the K.u.K. Army. Hermann Freiherr Kövess von Kövessháza died in Vienna 22 September 1924, and was buried in Budapest. 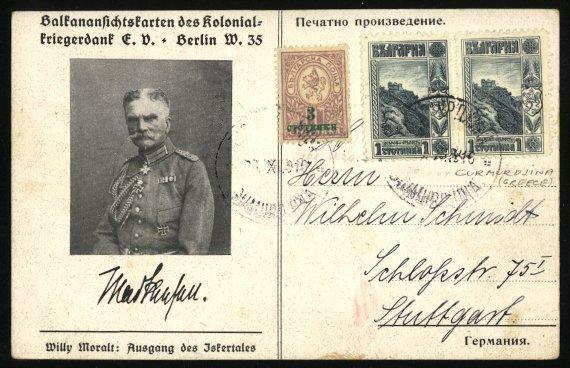 At the beginning of World War I General August von Mackensen (1849-1945) fought at the East Front at Gumbinnen, Tannenberg, Lodz, Warszaw and Masuria. In the Spring of 1915 he was given command of the XI. Army at the Galisian front. In April the same year he broke through the Russian positions at Tarnovo and aided the Austrian recapture of Lemberg 22 June 1915. Mackensen was then given the task of leading the campaign against Serbia in October 1915, which he did with great veracity using German, Austrian and Bulgarian troops. When Romania declared war on Austria in August 1916, Mackensen was transfered to Bulgaria where he organised the Army of the Danube with participation from Bulgaria, Tyrkey, Germany and Austria. 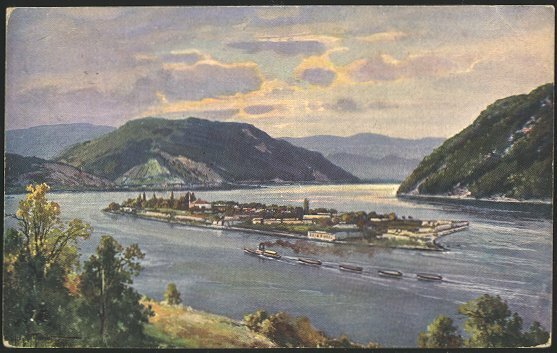 He invaded Dobrudja and crossed the Danube to cut off the fleeing Romanian forces. Mackensen's efforts speeded Romania's defeat, and he was promoted to field marshal. He commanded the occupation army in Romania until the end of World War I.